Automatically switches from power cord to generator simply by starting the generator. 30A 120V Relay Base. The LPT30 is intended for usage as an electrical transfer switch to automatically switch multiple sources (from one to another), i.e. switching from shoreline to generator power or switching from electronic inverter to shoreline/generator. The LPT30 is primarily designed for installation in conjunction with a generator having a rated output of not larger than 4.5kw, an external power cord having a rated output of not larger than 120VAC, 30A, 1PH, 60HZ and an electronic inverter having a rated output of not larger than 3600 watts. Physical Size: 6" x 6" x 3"
Install vertically or horizontally in a dry, accessible area. 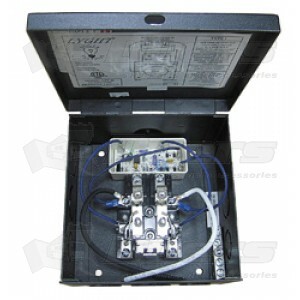 *Maximum service 120 VAC, 30AMPS single phase: must be used with a circuit distribution panel having a main breaker rated 30AMPS-1 Pole, or less. Suitable for installation in conjunction with power supplies having rated outputs not larger than 120VAC, 30AMPS.